What Really Happened to “World Trade Center Building 7” on September 11, 2001? | "Global Possibilities"
Home » News » What Really Happened to “World Trade Center Building 7” on September 11, 2001? What Really Happened to “World Trade Center Building 7” on September 11, 2001? Today, on the 15 year anniversary of 9/11, there is so much evidence and information available that debunks the official narrative of September 11, 2001, it is hard to believe the U.S. people have not yet revolted. 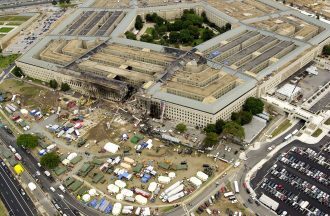 From the apparent implosion of the World Trade Center buildings to the lack of airplane wreckage at the Pentagon site, the official story maintained by the U.S. government simply doesn’t hold water. And the implications for the U.S. people (and the global community in general) are staggering. 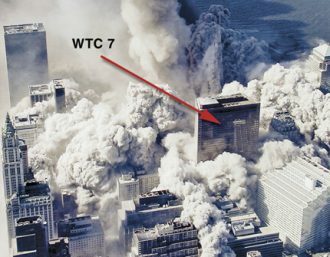 This article examines the collapse of the lesser-known building on that fateful day — World Trade Centre #7 or WTC7. 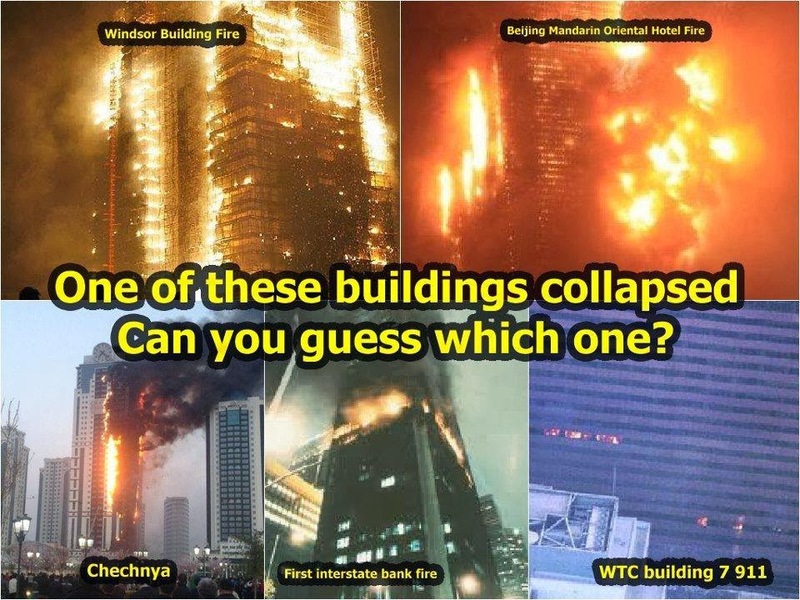 Strangely, many people outside the United States were not even aware that a third building in the World Trade Center complex had collapsed, mysteriously imploding into its own footprint around 7 hours after the Twin Towers were taken down. In fact a Zogby poll of Americans in 2006, 5 years after the event, found that 43% of respondents were not even aware that WTC7 had collapsed. This apparent omission from the primary 9/11 narrative repeated and replayed by the United States media speaks volumes, adding further weight to the physical evidence that all is not as it seemed on 9/11 — nor as it was reported by the media. Built in 1984, the WTC7 building was a 47-story steel frame skyscraper that formed part of the World Trade Center complex. It collapsed at 5:20 pm on September 11th, 2001. However, it was not hit by an airplane and suffered minimal damage compared to other buildings much closer to the Twin Towers. The official story from FEMA (Federal Emergency Management Agency) was that “the collapse was not primarily caused by actual impact damage from the collapse of WTC1 and WTC2 but by fires on multiple stories ignited by debris from the other two towers that continued unabated due to lack of water for sprinklers or manual fire fighting”. The full report can be downloaded here. However, there are many facts about WTC7 that contradict this assessment. The following facts are supplied by Remember Building 7, a non-partisan effort to raise awareness of the destruction of World Trade Center Building 7, led by the family members of 9/11 victims. You can learn more about their investigations here. 1. If fire caused Building 7 to collapse, it would be the first ever fire-induced collapse of a steel-framed high-rise. 2. Building 7’s collapse was not mentioned in the 9/11 Commission Report. It took the federal government seven years to conduct an investigation and issue a report for Building 7. 3. More than 1,700 architects and engineers have signed a petition calling for a new investigation that would include a full inquiry into the apparent use of explosives in the collapse of Building 7, similar to those used in controlled demolitions. If you have not seen the collapse of WTC7, check out this short video, produced by AE911Truth.org and released on the 10th anniversary of 9/11, which shows the collapse of Building 7. Just like a controlled demolition, it falls directly into its own footprint at free fall speed. 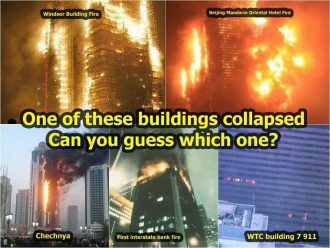 It is followed by a 2:30 minute video that shows complied footage of the building’s collapse from different angles (without sound). If WTC7 was in fact a planned demolition, there must surely be people who knew about it ahead of time. So what evidence is there of fore-knowledge? Witness reports show that officials who controlled the streets around WTC 7 evacuated the area in the hour before the 5:20pm collapse, and that various officials forwarded verbal warnings conveying certainty that the collapse would occur. This overview of witness accounts shows that the evacuation of the area surrounding WTC 7 started sometime around 4 PM, and was completed only a few minutes before the 5:20 collapse. The warnings of the collapse, which are recalled in dozens of accounts by emergency responders, show a striking consistency of conviction that the collapse would occur. In a revealing twist, it was not initially government agents or emergency services personnel who demonstrated fore-knowledge of the building’s collapse, but rather, it was at least 6 mainstream news/media outlets who announced live on air that the WTC7 building had collapsed — some up to an hour before it actually happened. In the footage below, you will see BBC reporter Jane Standley and CNN anchor Aaron Brown both report the collapse of WTC7 ahead of time, despite the fact that (as you will see) Building 7 is most definitely still standing in the background. How is it possible that this eventuality was reported so far ahead of time? How did media agencies like BBC and CNN know that WTC7 would collapse before it happened, when there was no reason to question the building’s intergrity, and even FEMA report say it was an unforeseen occurrence? Is it possible that groups like AE911Truth are correct in their assessment of a controlled demolition, and that news outlets were given a pre-planned false (propaganda) narrative to progressively “reveal” to the public as the day’s events unfolded? Could the discrepancy in reporting Building 7’s collapse so far ahead of time be due to the networks jumping the gun on the planned narrative and reporting it too soon? Or could the planned demolition have been delayed, occurring later than originally scheduled — and scheduled to be reported? And if so — if the the 9/11 attacks were in fact a staged false flag attack, planned and executed by (and/or with the support and consent of) the U.S. government — what could be the real agenda behind staging such an attack? 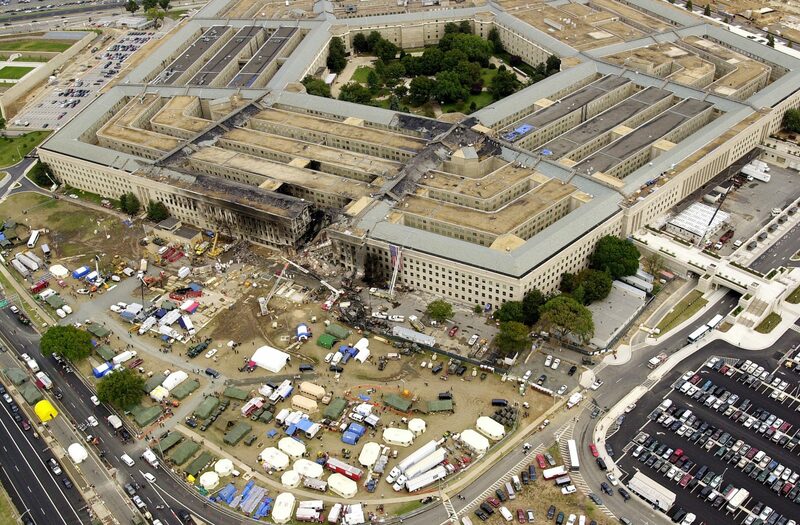 The Pentagon: Where is the plane wreckage? When we take into account the physical evidence that the three fallen World Trade Center buildings were the subject of planned demolition, the lack of airplane wreckage at the Pentagon site, the U.S. government’s adherence to a official story that is incongruous with that evidence, and the immediate increase in both domestic powers and highly profitable international wars that were “justified” by the 9/11 attacks, these are not just reasonable questions to ask — they are questions that the U.S. people need to seriously consider. 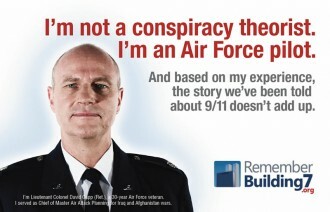 A group of concerned professionals known as Architects and Engineers for 9/11 Truth is comprised of over 1,700 verified architectural and engineering professionals who are directly challenging the legitimacy official 9/11 story. They have released the below trailer for their DVD “Blueprint for Truth”. The full 2 hour long movie can be watched here. According to AE911Truth, the collapse of the 47 storey WTC7 tower exhibited all the characteristics of classic controlled demolition, including evidence of the use of explosives. Sounds of explosions at ground level, only a second or two before the building’s collapse. Symmetrical “structural failure” – through the path of greatest resistance – at free-fall acceleration. Chemical signature of the incendiary thermite found in solidified molten metal, and dust samples. Slow onset with large visible deformations. So what REALLY happened to “World Trade Centre Building 7” on 9/11? Building 7 housed several intelligence and law enforcement agencies, and the NYC Office of Emergency Management’s Emergency Operations Center, more commonly known as “Giuliani’s Bunker”. Beside marking history’s most destructive attack on American soil, the destruction of Building 7 took with it innumerable intelligence records considered crucial to the Department of Defense — both of which are of major importance to the Secretary of Defense. Given the timing of this announcement, it was of course overshadowed in the media (and therefore the collective consciousness) by the events of 9/11, and questions of accountability over the “unsupported” trillions was quickly forgotten. According to the Department of Defense, auditors examining government records for the 1999 financial year concluded that $2.3 trillion in transactions to governmental financial statements were “unsupported”. While the Defense Finance and Accounting Service added that the “unsupported” entries are “not necessarily improper” and that documentation does exist “in many cases”, the documentation that does exist is inadequate and does not meet official auditing standards. No explanation was offered for the cases where no documentation exists, and no dollar value was publicly attributed to such cases. Of course, some claim that this discrepancy reflects only an issue of internal accounting/reporting and not the outright disappearance of funds. And in some cases, this was found to be true. However it is worth considering that 14 years later, in 2015, a Reuters investigation revealed that the Pentagon has actually continued the unreported use of taxpayer money in exactly the same fashion, to the tune of $8.5 trillion dollars, with no action taken (or even intent demonstrated) by the U.S. government since 2001 to close those apparent “gaps” in internal financial reporting mechanisms. According to Reuters reporter, Scot Paltrow, employees of the Defense Finance and Accounting Service (DFAS), the Pentagon’s primary accounting agency, were routinely told by superiors to take “unsubstantiated change actions” (ie. fudging the numbers), artificially bringing Department of Defense figures in line with the Treasury’s any time discrepancies couldn’t be traced and accounted for. And this process of “plugging”, as it is referred to internally, isn’t unique to Defense Finance and Accounting Service — it’s business as usual in every branch of the service. This raises the further questions: Why do top U.S. government officials seem so unconcerned about such poor internal accounting standards? Why do discrepancies routinely show financial shortfalls at the expense of American taxpayers, but not unaccounted surpluses? Could it be that such loopholes actually work to the advantage of those pulling the strings? And where could that money have gone? All we know for sure is that ultimately, DFAS doesn’t know what happened to the missing trillions, and nor do we. And the media hasn’t uttered a word about it since. As with any crime, there is one overriding imperative that detectives must follow to identify the perpetrators: follow the money. To conclude this discussion, I encourage you to watch the following investigation of the 9/11 money trail, compiled by the Corbett Report. Regardless of who did what, and why, thousands of innocent people were killed on September 11th, 2001. For that reason, I would like to offer my respect and condolences to all the friends and families of 9/11 victims. To conclude this article, I will leave you with the words of Mr. Bob McIlvaine, the father of Bobby McIlvaine, one of the many people who died in the attack on World Trade Center Tower 1. Andy Whiteley is a former corporate manager turned writer, editor and co-founder of Wake Up World. An advocate of peaceful revolution, Andy believes we are on an inevitable (albeit bumpy) path to a renewed social model grounded in love, transparency, individuality, sustainability and spirit. Through Wake Up World, he hopes to have a positive influence on that transition. 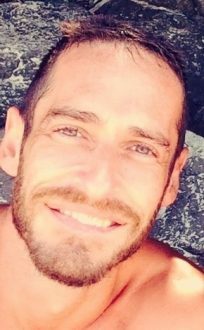 Andy lives in the southern Queensland, Australia with his life partners and spends his scarce free time keeping fit, dancing at drumming circles, and swimming the beautiful Queensland beaches. You can follow Andy on Facebook via www.facebook.com/joinwakeupworld.